Ircon®, the brand of choice for rugged, dependable, IR sensors used in harsh, high temperature environments, has introduced the ScanIR®3 infrared line scanners and thermal imaging system. The ScanIR3 Series includes a choice of eight models that provide accurate, real-time thermal imaging in a wide variety of industrial applications, including continuous sheet and web-based processes, as well as discrete manufacturing. Combined with Ircon ScanView™ Pro software, the ScanIR3 scanner is designed for reliability and continuous operation in harsh industrial environments. Its robust housing incorporates standard water-cooling and air purge, and also features built-in laser sighting. 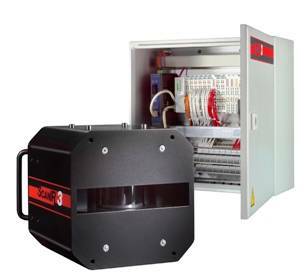 A rugged processor box provides universal input and output (I/O) capabilities in the field without the need for an external computer. The ScanIR3 line scanner has one of the fastest scan speeds in the industry and offers complete data about even the highest-speed manufacturing processes. Unlike point sensors that measure a single point, the line scanner measures multiple temperature points across a scan line. Its motorized mirror scans at rates up to 150 lines per second, allowing rapid detection of temperature non-uniformities and hot spots. Rotating optics collect infrared radiation at 1024 points within a 90-degree field of view, and industry-leading optical resolution (up to 200:1) enables detection of smaller temperature anomalies. A two-dimensional image is formed as the material moves across the line scanner’s field-of-view. The ScanIR3 system is exceptionally easy to deploy and manage: a single bundled sensing head cable with a one-click connector to the scanner allows for fast and trouble-free installation. The unit’s processor box supports various industry interfaces, including Ethernet, fibre optics (optional), and analogue/digital I/O. In addition, the multifunctional ScanView Pro software allows custom configuration of ScanIR3 operating parameters, and display of thermal images and temperature profiles on a standard personal computer (PC). This enables real-time thermal imaging for temperature monitoring, display and analysis—users can quickly detect a hot spot or non-uniformity before it becomes a problem. The software includes features to subdivide thermal images from the ScanIR3 line scanner into portions of specific interest. Temperatures in each portion can be processed for a certain math function, such as average, maximum, or minimum temperature. In case of a thermal defect, a fail-safe alarm is triggered and logged. The software also includes a movie playback function for stored thermal images. For interfacing with other control systems, temperatures are available as current or voltage analogue outputs by virtue of the analogue output modules provided as an option with the processor box. No PC is necessary to provide these outputs. It is also possible to output temperature values in a network via an OPC or DDE server. Users can specify security passwords and access levels with multiple language support. The ScanIR3 line scanner is offered with an optional modular, high-temperature enclosure system specifically designed to protect the scanner from exposure to ambient temperatures up to 1994ºF (1090ºC). While protected in this enclosure, the line scanner can operate comfortably in high-temperature processes, such as those seen in manufacturing steel and other metals, as well as glass and a variety of minerals.